The ‘brain housing group’, otherwise known as your head, is a pretty hard part of the body, and for some of us, it’s harder than others’ but that’s another subject…. But as hard as it is, it doesn’t stand a chance of protecting the ‘firmware’ contained within when it impacts hard surfaces – particularly at higher impact velocities produced after separating from your motorcycle. This is where your brain bucket – or helmet, steps in to save the day. Arai has been at this business of protecting riders’ heads for quite a long time, with the company getting its start back in the ’30s as a hat manufacturer. Obviously, they make a different kind of ‘hat’ now, which brings me to the new Corsair V model. Riders familiar with the Arai line could easily conclude this to be another evolution of the Corsair, but it is actually a nearly completely new helmet. 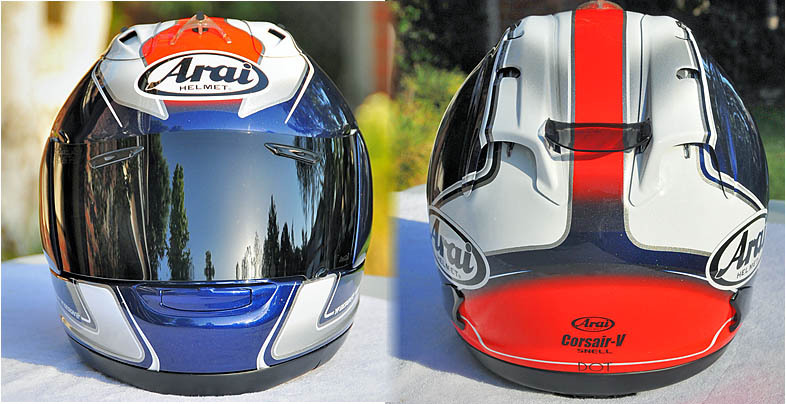 The Corsair is also known as the RX-7, a model reference dropped by Arai here in the states. The most obvious outward difference is the rear wing. It isn’t a rip-off design from a fast ‘n’ furious parts catalog, it actually has a real world function. It is adjustable through five positions to reduce wind buffeting from an upright position (upper adjustment) to a full tuck (lower, close to shell) After this you may notice differences in the diffuser. After the ‘click vent’ on the diffuser there is another intake slot that produces added venturi effect to help pull air through the helmet interior. The click vent controls themselves are a little larger to make operation while wearing gloves more positive. The center vent is reshaped and larger to move more air as well. Looking at the side vents, an added side cowling isn’t there to look George Jetson, nosirree …. The side cowlings pull double duty. The first is to create a greater exhaust effect to pull warm/hot air (bad breath) out of the interior. The other function they serve is to work with the rear wing to enhance lateral stability at speed (track speeds, that is). The brow vents in the faceshield lead to air channels that now direct cooling air over the temple artery which carries blood to the brain, so its cooling benefit should be obvious. The chin vent continues its function as before – that is, it moves air to the mouth, and directs air up to the interior of the face shield to help prevent fogging. 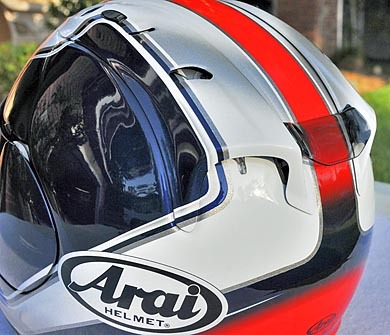 Moving to the interior, you’ll find Arai’s latest removable and washable “Dry-Cool” liner. An added feature is the removable, vented neck roll. A new ear pad foam helps reduce noise. The rear snaps of the liner have been repositioned closer to the bottom of the liner, making its fit more secure. The most important feature of the interior is the new orange pull tabs just aft of the chin bar on both sides. 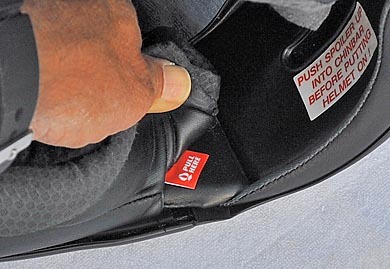 Emergency response crews can pull these tabs to release the cheek pads, enabling them to much more easily remove the helmet. In the chinbar is a pull down spoiler, which, when in its lowered position, smooths airflow to help reduce turbulence and therefore reduce noise. And now for the shell of the helmet. The more pronounced ridge around the lower edge of the shell (called the “Outward-Flaring Hyper-Ridge”) is there to strengthen that area of the helmet, which also lowers the helmet’s center of gravity, allowing it to rest easier on your head. And because it flares out, instead of in as before, the opening is larger, independent of the shell’s actual size. “So what?”, you say. I’ll tell you what – the larger helmet opening makes it easier to put on and take off, which hopefully will cause you you to select the helmet size that fits properly, rather than the one that fits over your grape easiest and disturbs your hair the least. At the top of the helmet, in the forehead area, is Arai’s ‘peripheral belting’ that is just above the eyeport. This is a design brought over from Formula 1. If the wearer is thrown forward into a frontal impact, this could make a significant difference. Seeing your race track rival / distracted car driver in your peripheral vision will now happen earlier than before, thanks to the 10mm larger eyeport. The face shield now fits very flush to the helmet shell. Small plastic blocks are now necessary to prevent the shield from contacting and scratching the helmet surface when raised. The shield side pods are more recessed into the shell, as well. That’s a heck of a lot of thought given to the design of a helmet. Did they over-think it all? Answer – No. How does all this work in the daily grind of commuting, canyon carving and race track knee dragging? Answer – Excellent. I recently had to ‘use’ the impact protection feature of my old Arai Quantum 2 at a track day, which greatly saddened me, as it was the Kevin Schwantz replica – R.I.P. To soothe my pain, Motorcycledaily and Arai teamed up to put my noggin in their latest flagship helmet. As users and admirers of Arai helmets can attest, their fit and finish is exceptional, and this Pedrosa replica (save your nasty comments, please) is particularly striking with its metal flake paint and strong symmetrical graphic design. Fit is similar to the Quantum, despite the Quantum having a round oval shape and the Corsair V having an intermediate oval shape — perhaps, I’m in between. Nevertheless, it fits well, with no hotspots. The new interior felt coarse, unlike my Quantum, but became more agreeably tactile as it broke in. Once inside, the eyeport appears larger than the 10mm would suggest, greatly enhancing vision to either side. Moving the shield proves to be a little more of a challenge because of those plastic spreader blocks. Temperatures were a bit chilly in the mornings when I first got the helmet, and although the vents were closed, small currents of the chilly air could be felt entering the helmet, but nothing major. No whistling, either. As the season moved toward summer, the vents provided welcome and significant relief from the heat. Having everything open moves some serious CFM (cubic feet of air per minute). If you pay attention, you feel the air streaming over your temple. It’s subtle, but the brow vent functions as Arai says it does. With the vents open, interior noise increases, but this is a consequence of any vented helmet. Closing the vents brings noise levels back down noticeably. I wear ear plugs all the time, though, so this is not a problem for me. Arais are among the quietest helmets on the market, ear plugs or not. Does the rear wing work? I can say yes, but to me it was only noticeable on the race track. The issue of lateral stability was a non-issue. Popping up at the end of the front straight at Fontana in excess of 150 mph did not see the helmet buffeting side-to-side, or even any drag significant enough to cause strain or fatigue of my neck muscles. All day rides to your favorite locales and back will bring to the fore even the smallest aggravating detail of a helmet. Arai’s efforts in producing differing helmet shapes, comfortable and washable interiors, and effective air venting all combine to make wearing it feel like a natural extension of your body. It’s presence can almost be considered transparent as far as helmets go, and that’s probably the greatest compliment I can give a helmet that I haven’t crashed in – yet…. If that event comes to pass (again), I have full confidence in Arai’s ability to produce a helmet that not only coddles my head day-to-day, but is also eminently capable of fulfilling it’s most basic, and most important function – giving me my best chance of being around to lament ruining yet another helmet. The real question is why does Arai stay with this system when a podless one is so much cheaper and easier to make, and more “intuitive?” Because, in the very strict world of Mr. Arai, “the job of a motorcycle helmet has not changed. You can do things to it as long as you never forget the basics – protection against impact.” The shell’s job is the rapid dispersal and dissipation of impact energy over the smoothest possible surface. Because podless systems can require up to a ½” depression in the shell to fit the shield mechanism, it is his feeling that this creates a “ledge” in the shell that could possibly interrupt the rapid shedding of impact energy over the least unbroken surface. (Does water flow more easily through a trough or over rocks?) The depression can also result in thinner padding in that area. Arai stays with its system because the shield mechanism’s depression is both very narrow and sloped to help the shell do its job better. That’s what he cares most about. Arai’s pod system is considerably more complex and expensive to design and build. And yes, we know it’s not “intuitive.” But at this company, the question’s not about intuitive. * It’s not about pod vs. podless. Or fad and fashion. It’s not about “selling more product.” It’s about rider protection, about doing the best job we can. Here’s a company responsible for virtually every innovation on the modern motorcycle helmet (list gladly furnished), and nobody asks why they’d stay with this shield system? * Anyone who wants to see how easy it is to change an Arai faceshield can log onto the website and watch Nicky Hayden and Kenny Roberts Jr. change their faceshields – with their helmets on! $615.00 to $815.00 for an Arai helmet? Oh yeah, I’m going to rush right out and by that! Perfectly safe, fully-functional and visually pleasing helmets sell for less than $300.00 every day. 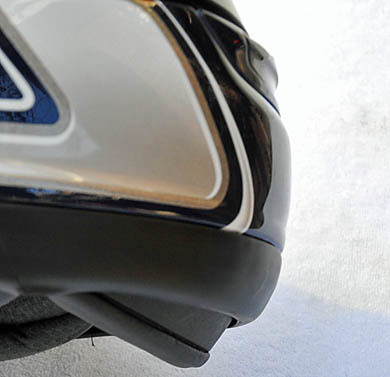 Shoei offers excellent helmet values at under $300.00. Better models for under $400. HJC sells helmets for even less and they’ve proven themselves on Ben Spies noggin in WSBK. Paying $700 for Arai’s helmet gizmo stuff and wild paint makes no sense in this economy. Did you try changing the shield? Did you pop off the side plates? Did the little microtab break putting it back on? Arai makes the WORST shield replacement EVER in the HISTORY of mankind. Compare it to, say, a Shark helmet. Or Shoei. An $800 helmet with a shield replacement mechanism that would result in an F for any of my Mechanical Engineering students?